How does the leisure battery work in my campervan? 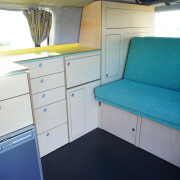 With an Achtung Camper campervan you will be fitted with a second leisure battery to run your campervan electrics from. This works automatically and ensures that your main car battery will never run flat. The leisure battery automatically charges whenever the car is running. When stopping somewhere without power for a few days in your campervan (or if you don’t have a 240 volt connection in your van) you’ll be able to run your fridge, lights, TV, charge your mobile phone and laptop without a problem. You will be able to stand stationary with your van and not turn it on for 2-3 days if it’s colder weather and about a day if it’s quite hot. After a certain amount of time if you haven’t started the van and have been running all of these appliances your leisure battery will go flat. You will notice if it’s flat because your fridge will turn off. You can go for a long drive (3 hours minimum to fully recharge your battery). You can idle your van for about 30 minutes to get it up to a good charge and then get your solar panels out and connect them which will recharge the battery. If you are free camping and plan on spending longer periods in the one spot we’d suggest getting out your solar as soon as you arrive and placing it in a nice sunny position so you can forget about it and have unlimited power. Powering up your campervan - The difference between 12 volt and 240 volt.